Nothing makes a better impression on your customers, clients, and employees like a clean facility. Call AC’s Janitorial Service for professional commercial and industrial cleaning services. You’ll enjoy the exclusive benefits that come with our preferred tenant services. General cleaning: General cleaning includes the routine tasks that are needed to keep your workspaces tidy and attractive. This is a surface cleaning that will remove dust, cobwebs, and the everyday buildup that results when you have employees and/or customers traveling in and out of your facility. Consider this the regular maintenance you need to do to keep your commercial or industrial facility at its best. Restroom (including supplies): Clean restrooms are vital to the health of your business. You want your restrooms to be sanitary, but you also want them to be comfortable for your employees, customers, and visitors. Our cleaning service will give your restrooms a deep cleaning on the schedule you need. We’ll also help you stay well-stocked with paper products and other supplies. Kitchen and break rooms: Kitchens and break rooms are two other areas where cleanliness really counts. Keep them looking their best so the people in your office or facility will have an adequate space for cooking, eating, or taking a break. Our staff will make sure all areas of your kitchens or break rooms are clean, fresh, and appealing. Carpet care including vacuuming, spot cleaning, and shampooing: Did you know that carpet is the most commonly found flooring surface in today’s offices? Just like the carpet in your home, it can show its age if it’s not taken care of. Although office carpet is typically more durable, it also must stand up to more foot traffic on a daily basis. Regular vacuuming, spot cleaning, and shampooing is important for keeping your carpet sanitary and attractive. Let us do the dirty work for you! Floor care for marble, terrazzo, cement, wood, vinyl tile, rubber, and ceramic, as well as raised tile flooring (on the surface and underneath): Commercial flooring surfaces are made to stand up to just about anything. But that doesn’t mean you don’t have to care for them. Just like the floors in your home, you want to make sure you’re performing regular maintenance to keep these areas looking good. Besides that, a cleaner floor is often a safer floor—something that’s definitely important in a commercial or industrial setting. 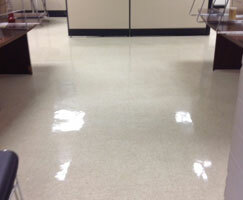 Call to learn more about our commercial floor cleaning in North Carolina. Fabric partition cleaning: Fabric partitions are one of the most common surfaces in an office. 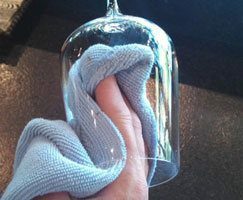 But all too often, they’re overlooked when it comes to cleaning. Cubical walls collect dust, dirt, and other contaminants over time, so wiping them down a couple of times a year isn’t enough. Our professional commercial cleaners will use cleaning methods that protect the fabric while getting rid of everything you don’t want floating around your office. Windows: Dirty windows make your property look neglected. On the other hand, sparkling clean windows make any building look newer and fresher. Let the light in and give your employees and customers a better outlook by hiring us to keep your glass clean. We take all the hassle out of a job that lots of people try to avoid! Furniture: People spend more time at work than they do at home. It’s no wonder that office furniture has to withstand a lot more wear and tear. Regular cleaning is the best way to get the most life out of this investment. Keep upholstered surfaces on chairs and partition walls deodorized, bright, and sanitary with our commercial furniture cleaning services. Floor cleaning and waxing for any material, including marble, terrazzo, cement, wood, vinyl tile, rubber, and ceramic: Quality flooring materials are an investment. Don’t install them only to forget about them! When you hire us for commercial floor cleaning in North Carolina, our team will determine exactly what type of cleaners and cleaning techniques to use on your floors. They’ll look great, stand up to the elements, and perform under the demanding conditions of your industrial or commercial facility. Furniture cleaning: Do you have benches, chairs, tables, or other outdoor furniture at your place of business? Keep them free of dirt, pollen, and mildew with our exterior furniture cleaning service. We’ll make sure your customers and guests are left with the best impression possible of your company. Windows (inside and outside): Dirty, streaked windows block natural light from your offices and give a bad first impression. We’ll give them a sparkling shine you can be proud of! 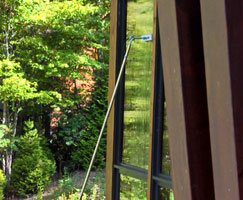 We use the best methods possible to remove dirt, grime, pollen and water stains from your windows. Grease removal: Commercial kitchens are busy places. Over time, grease buildup will lead to an unsightly appearance and unpleasant odors. It can even create a fire hazard. Don’t put your safety at risk. Call us for commercial grease removal. Concrete sidewalk, porch, and driveway: Concrete is a durable surface that works well for a variety of commercial uses. However, it can stain easily. If your concrete sidewalks, porches, or driveways aren’t looking their best, we can help. Our concrete cleaning services will have them looking as good as new. Deck cleaning available: Decks add value and extra outdoor space to your property. But the sun, wind, and rain all take their toll. 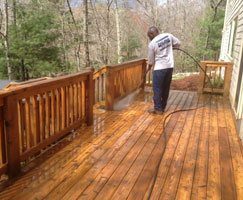 Our deck cleaning services will restore the wood to like-new condition. Don’t assume that your deck is old, worn, and in need of replacement. It may just need a good cleaning from our team of professionals.